Legendary Producer and Filmmaker Neema Barnette (Civil Brand, Women thou Art Loosed: On The 7th Day, Queen Sugar) presents BHMD Micro Docs. These are even faster ways you can educate young and old about the varying contributions of Blacks in American history. Think of it as the "Cliff Notes" for the digital age in only 20 seconds. 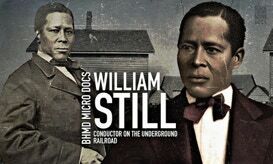 William Still (October 7, 1821 – July 14, 1902) was an African-American abolitionist in Philadelphia, Pennsylvania, conductor on the Underground Railroad, writer, historian and civil rights activist. He was chairman of the Vigilance Committee of the Pennsylvania Anti-Slavery Society. Over the years, the Harlem Globetrotters have played in more than 115 countries in front of 120 million fans. They have been the subject of two feature films and numerous television shows, including two animated series in the 1970s.